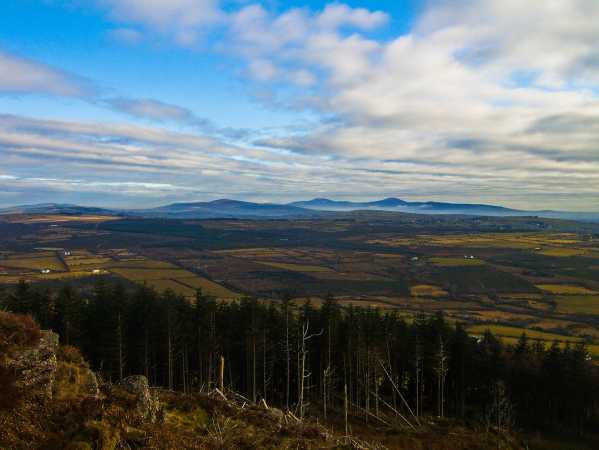 The name Sliabh gCruinn also occurs in Co. Waterford (Slievegrine). The English name, Tory Hill, refers to a raparee. There is also a hill of this name in Co. Limerick. According to Rev. William Carrigan (the History and Antiquities of the Diocese of Ossory, 1905), Tory Hill in Kilkenny was so named from a famous outlaw named Edmund Den, who flourished in this locality, about the year 1700. Carrigan also reports that an annual pattern took place on the 2nd Sunday of July, locally known as 'Tory Hill Sunday' or 'Frochan Sunday'. On the flat ground below [the hill] called the Faithche (now the townland of Fahy), great games of hurling were said to have been held, sixty players to a side (MacNeill, 230-231). Tory Hill is the 1172th highest place in Ireland.